Iranian President unveils tough new budget in wake of US sanctions, but vows US will be defeated. Iranian President Hassan Rouhani on Tuesday unveiled Iran's first annual budget since the return of US sanctions against the country, saying it had been adjusted to take account of Washington's "cruel" measures, according to AFP. The President vowed that the US will not succeed in bringing Iran to its knees with the sanctions, that were reimposed after US President Donald Trump withdrew from the 2015 Iran nuclear deal. 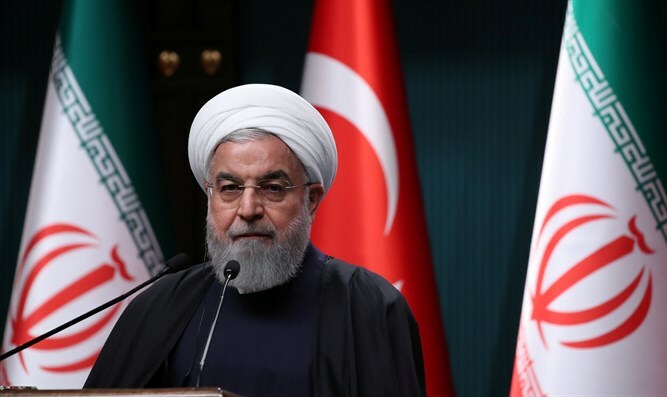 Rouhani on Tuesday announced a 20 percent increase in public sector wages in a sign of the economic challenges the Islamic Republic has faced since the US imposed two rounds of sanctions on it, the latest of which went into effect in early November. Those sanctions aim to reduce Iran’s oil exports to zero in a bid to curb the Islamic Republic’s missile program and regional influence. The speech gave only a few general points of the budget -- which will now be scrutinized and voted on by parliament -- but acknowledged the pressure Iran was under. "Last year we faced some problems," Rouhani told parliament in a televised speech, referring to the widespread protests that hit the country almost exactly a year ago, sparked by anger over economic and political conditions. "Those events caused the Americans to change their position regarding the Islamic Republic and the nuclear deal," he added, according to AFP. "The real objective of the US in all of this conspiracy and sanction and pressure... is to bring the powerful Islamic republic of Iran to its knees," he said, vowing that the US "will definitely be defeated." The new budget did not say how many barrels of oil Iran hopes to sell in the next financial year, which starts in late March, but analysts believe it will be considerably less than the approximately 2.5 million it sold per day prior to Trump's withdrawal. The US granted waivers to eight key buyers of Iranian oil -- including China, India and Turkey -- though this has been a double-edged sword for Iran since it also helped push down the global price. "At one point early this year our foreign exchange cash reserve was practically zero, forcing the government to take hard decisions to save the country," Rouhani told parliament. The government has pressured exporters to return their dollars to Iran, and Rouhani said they would lose tax incentives if they failed to repatriate their cash. Rouhani has changed his tone regarding the sanctions in recent weeks. He initially insisted that the new US sanctions have had no effect on Iran’s economy because Washington had already practically reimposed them earlier. Earlier this month, Rouhani said US sanctions against his country amounted to "economic terrorism". Iranian Foreign Minister Mohammad Javad Zarif earlier this month vowed that US sanctions will have no impact on the policies of the Islamic Republic at home or abroad.